Where do grapevines come from? Can their diversity improve the resistance of grape cultivars to diseases? In a study from Cornell University–Genetic structure and domestication history of the grape–the authors support the archaeological origin of the grape, look at the relationship between its domesticated cultivars and its wild ancestor, and study its change in genetic diversity along its journey to the west, as well as how it can help finding approaches that can generate improved disease-resistant grape cultivars. 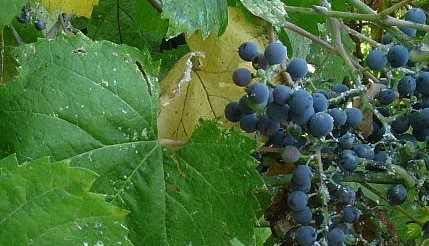 The grape, which has been domesticated since antiquity as species Vitis vinifera subsp. vinifera, is primarily processed into wine, but also as juice or consumed as table grapes. It is thought that its cultivation started 6,000–8,000 years ago in the Near East (in the South Caucasus between the Caspian and Black Seas, before spreading to Egypt around 5,000 years ago) from its wild ancestor, Vitis vinifera subsp. sylvestris. Since that time, the 10,000+ cultivars we know of today come from vegetative propagation and crosses. This diversity, which vinifera retained at high levels since its domestication, remains relatively unexploited within an extended pedigree, and could be one solution to the various grape pathogens we witness these days, and which are subject to an extensive use of chemicals. The authors deduct from this data that only a small number of cultivars were involved in grape breeding, and therefore that there are still a lot of possible genetic combinations that remains to be explored within vinifera due to the considerable genetic diversity which has been maintained in the grape during its long history of domestication. This concept of “hub”, pattern found in network theory in general, is represented here by a small number of cultivars being highly connected (while most cultivars have only one or two first degree connections), and representing the most used (and therefore ancient) cultivars for breeding. Finally, the authors define the process of vegetative propagation during grape breeding as a “double-edged sword”: needed to produce quality wines by controlling genetic variability, it seems to have discouraged the breeding of new cultivars, which would at least explain partially why the worldwide grape industry is “dominated by cultivars sharing extensive coancestry” (among other factors such as diseases like phylloxera for instance). The authors emphasize the usefulness of studies genetically characterizing the world’s germplasms collections (such as this one), and applying specific techniques (such as marker-assisted breeding) to improve the resistance of grape cultivars to diseases as well as developing an environmentally sustainable wine and grape industry.